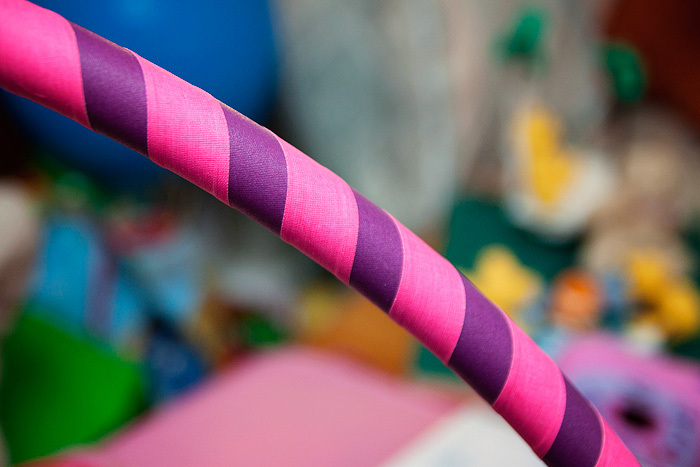 I took delivery of my new hula hoop yesterday – it’s very pretty, which I’m sure isn’t supposed to be the thing that I’m most fixated upon when it comes to exercise equipment. After getting my interest piqued in the idea of taking it up as an exercise (thanks Cami) I went and bought a Casall Rock Ring but it gave me hella bruising and a back-ache that wasn’t subsiding and after speaking to a hooping guru (yes, there is such a thing!) on Twitter – she advised me that those super-heavyweight things with their bumps and nobbles can actually cause damage to your kidneys, spine and skin – I’ve since put it back in the box just in case. 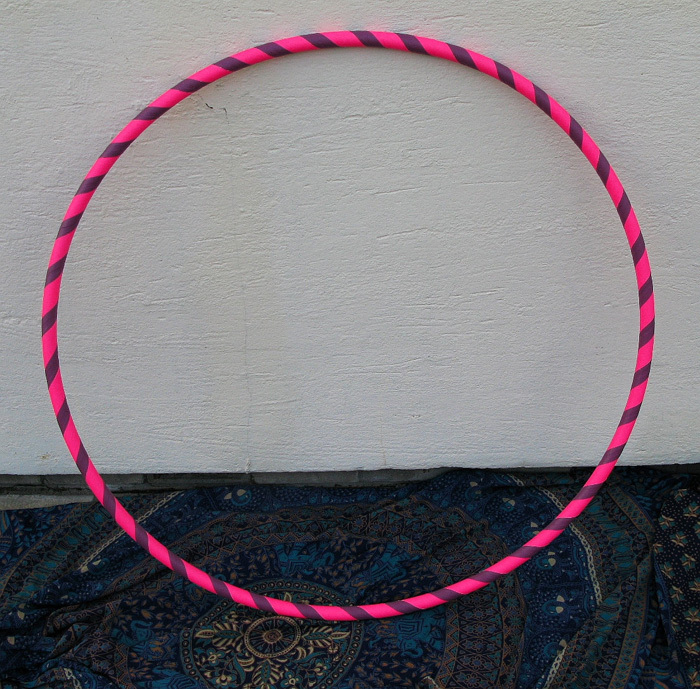 Instead, she linked me to an Etsy shop (temporarily closed) that offers hoops suited to dance and general exercise and so I went ahead and ordered this one, let’s call her Sally. Here she is in my photo… I would have taken a piccie of her in full circular glory but I hadn’t picked up Leila’s toys as you may notice from the tornado of multi-coloured, blurry crap in the background. I love Sally. She’s very springy and comfortably solid without being heavy. At 40″ diameter, she’s pretty hefty (much like her owner) and everyone ducks for cover/moves glasses off tables/runs for their lives when I pull her out from behind the sofa. She’s so much fun – fifteen-minutes of exercise infront of MTV has never flown by so quickly! I’m a bit of a n00b at finding my rhthym but for once, I can do something better than my husband who basically turns into Mr. Bean. I wish I were tall and thin. Hula hooping is 57320x more elegant when you look like that. I just look like a potato with a belt. Hooping? Have you done it since you were four? Oooh, I’ve not tried it for ages and having since seen Ridiculously Beautiful and Talented Hoop Girl at Cirque Du Soleil (and Grace Bloody Jones with her awesome 64 yo pins) I don’t think I’d look very good! I loved hula hooping as a child but my boss and I recently had a go on her granddaughter’s hoop one bored day in the office and neither of us could do it. I’m not sure if it’s the hoop or whether I’ve lost my hooping rhythm! Would love to do this as a form of exercise, I can’t stand the gym! I had a hooping phase a couple of years ago, but my hoop’s been gathering dust lately. I ought to drag it back out from the depths of the basement! Must look into hula-hooping, haven’t done it since I was a kid 30 years and 2 children ago! also, what is the music?? The music is lovely isn’t it? It’s called Jezebel by Iron and Wine. I never thought I’d see the day when someone could dance to Iron and Wine! Speachless!! What a talent! How easy & graceful she makes hoola-hooping look. My kids have hoops but I have trouble keeping them. circling my waist for longer than a few seconds. In my PoundLand store they have a lot of DVDs of a hula hoop based aerobics regime. It’s called Hularobics I think. Have a look in yours if you can! Oh I will, thank you for the heads up! Oooh! hula hooping was my childhood past time. Now, I still enjoying doing it to keep my self fit. It’s a nice form of exercise. It looks beautiful done like that. If I did it my hips would generate a visible shock wave, like that produced by an atomic bomb. Is there some sort of secret trick to hooping because for the life of me I just can’t get it right, HALP! Have you watched some of the You Tube videos? Once I stopped sticking my bum out and bent my knees a little, it helped!